custom cabinets, yurts, and creative cabins - or whatever you desire! - we actually really like small jobs! and eat your meals, raise your family - and live your life. Our priority is to provide high-quality craftsmanship at a reasonable price. Call or email us and we'll provide a free estimate for your project. I have been working with wood for the past 11 years and have a wide range of carpentry experience - from remodeling and home improvements to working in a custom furniture shop. I enjoy fixing a stubborn door or patching a hole in the wall just as much as I do making and installing cabinets. I really like small jobs too! Is there an area in your house that is constantly cluttered? I can design a storage solution to organize your stuff. I keep my overhead low which allows me to work for a reasonable rate while still taking pride in a beautiful finished product. In addition to working on "square" houses, I also design and build wooden taper-wall yurts. More substantial than the common vinyl covered lattice wall yurts, wooden taper-wall yurts are completely insulated and surrounded by windows. 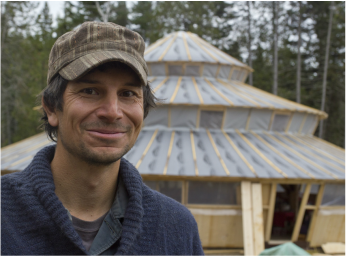 In the summer of 2014 we built a large 3-story yurt in Maine with a crew averaging 12 for the Wehrweins (background of photo at left). Contact me if you'd like a custom design or a set of pre-printed plans. I learned most of what I know about yurts by building and laughing with Bill Coperthwaite for six years. A group of us have recently released a website to carry forward inspirations we shared with Bill - you can see it here. I live in Guilford, VT with my wife Nika and daughter Ella. On days off if I'm not carving a spoon, I enjoy growing food in the gardens, orchard, and woodlot of our homestead. Bob's a bit of a dinosaur - He was a contractor in California for 40 years and has gobs of information on foundations, framing, plumbing, electrical, and even your fuel filter. His wife dragged him to the East coast a couple years ago and about the middle of February, some days he wishes he was back in California. Call him and he'll tell you everything you need to know.